Asian stocks fell on Tuesday, tracking losses on Wall Street as traders braced for an interest rate hike by Federal Reserve. 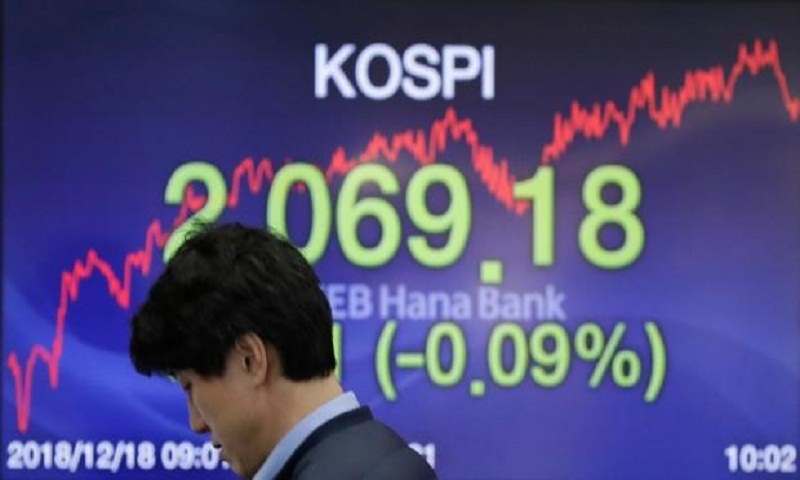 KEEPING SCORE: Japan's Nikkei 225 index was 1.2 percent lower at 21,242.66 and the Kospi in South Korea dropped less than 0.1 percent to 2,070.54. Hong Kong's Hang Seng eased 0.3 percent to 26,022.16. The Shanghai Composite index dropped 0.6 percent to 2,583.51. Australia's S&P ASX 200 was down 0.9 percent at 5,609.00. Shares were lower in Taiwan and Southeast Asia. FED MEETING: The Federal Open Market Committee begins a two-day meeting on Tuesday. It is expected to raise its short-term interest rate by a modest quarter-point, to a range of 2.25 percent to 2.5 percent a day later. The rate is used as a benchmark for many consumer and business loans. Investors fear more monetary tightening would weigh on U.S. growth, and eventually, the global economy, that is already expected to slow in 2019 because of trade tensions. President Donald Trump tweeted that it was "incredible" the Fed was considering another rate hike, with "a very strong dollar and virtually no inflation." The central bank forecasts three more rate hikes in 2019.